A major town in South London or Surrey depending on your point of view — it is within a Greater London borough (of the same name), but classified as Surrey from the post office's point of view. It is within the CR0 postal district (as well as CR9, which though non-geographic, is used for large businesses which are based in the centre). 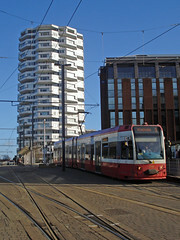 Croydon has grand aspirations — like many large towns it applied unsuccessfully for city status in 2000 and 2002, and it has a number of "skyscrapers" in the town centre. Croydon is particularly notable for two things. Firstly it has excellent transport links: for Central London, Brighton and many other south coast destinations, and locally thanks to an extensive bus and tram network. Secondly, Croydon is a significant local shopping nexus, with two large "malls" in the centre (the Whitgift and Centrale centres, with another in the planning stages) and a considerable out-of-town retail park on Purley Way. Historically, Croydon can boast the world's first (horse-drawn) public railway, and London's first international passenger airport (opened in 1915, but now long gone). Although the centre is largely given over to commercial and industrial use, there is a notable pocket of residential development just to the south-east, close by East Croydon Station, the Park Hill 'Village'. It was laid out in the 1960s and 70s, replacing a stately home, and is bounded on the east by the Tramlink tunnel and [Lloyd Park]?. Last edited 2014-01-27 13:46:11 (version 16; diff). List all versions. Page last edited 2014-01-27 13:46:11 (version 16).